As I may have mentioned before, i’m working on a ranged build for my warrior. While the Squad Commander build is awesome for support and a great melee build for WvW, playing a Smuggler Saboteur in Star Wars: The Old Republic spoiled me on ranged classes. I want a build that can put someone down in a hurry. After hours and hours and hours messing around in the Mists, I think I finally hit gold.This build is now available here! It’s a good build, don’t get me wrong. In fact, it’s the most fun warrior rifle build I have tried yet. My plan is to make sure it’s a viable WvW build first, as that is what is most important to me. So far all my WvW experience has been one sided. Either our side, or their side. I am, respectively, stomping and getting stomped pretty handily. After I get some more even back and forth experience in WvW, I want to try this build in sPvP. It seems like it could really play a good DPS role with a team. Likely this will come down to which amulet to use given it’s current performance. Might swap a trait or two as well, but I think I can keep it within the build I have currently. I have already run a dungeon, marathon world event, and too many Fractals with it. I can tell you it’s decent enough in PvE as well. I had no problems with it, and have no problems recommending it. Dungeon run approved. Here’s a little video footage of me testing this build in WvW. Enjoy. Leave your suggestions for a build nickname in the comments. I’d like to consider a few reader’s ideas. P.S. Thanks again to YouTube user Lela Blyler for pointing out I was calculating Volley damage incorrectly. 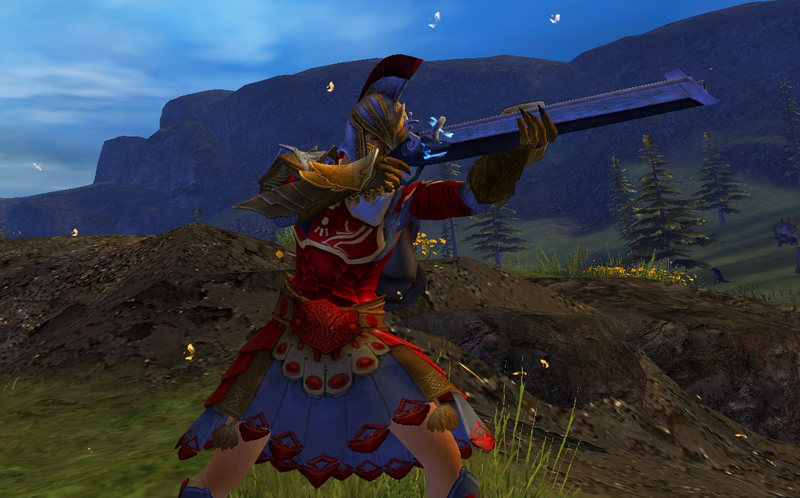 Hi guy, I have the same favorite as yours on using warrior, especially playing rifle in WvW. It is a playful DPS in WvW, while many others do use Mesmer or Elementalist. Glad to wait for your build here for Rifle Warrior Build. I just played GW2 for two months and work hard for my warrior to level-up. Btw, I do like my warrior when doing on the enemies by serious bleeding too 🙂 !! This build is ready! Link is just above the picture. The warhorn build is the one i’m working on. I love the rifle, but i’m not sure how I feel about Condition Damage. I always feel like they get away in WvW because i’m not doing enough damage. I know it just takes time, but it’s the surviving during that time that’s a challenge. Maybe I should try Power/Toughness/Condition damage gear. I’ve found toughness to be very helpful. Have fun! Let me know what you think. and wheres build, wheres gear, wheres anything and everything ! I should have it up this week. I’m still fine tuning the sigil choice mostly. Work has put an unusual demand on my time, and I work 12 hour days usually. Sorry it’s been slow, but the post is already partially written. Tomorrow is the sPvP portion, and I’ll try to get out the rest later this week. Next story Just Barely Made It!